And down the hill towards town. A bit more change here and so a bit more randomness about the now shots. 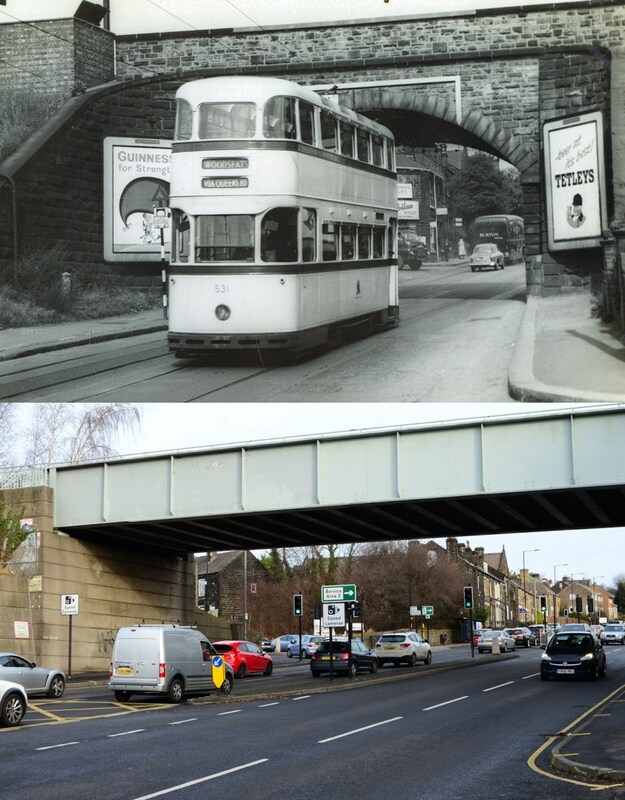 Looking from the junction of the Crookes and Walkley routes down Hounsfield Road. The pointsman's hut is now superfluous as the lines to Walkley have gone although their location is still obvious. Then was 21/4/57, now was 27/12/16. I should probably have been further to my left, but I think the change is clear. At least there is one building remaining for reference. Again, a bit of guesswork here and the usual problem of angles being wrong due to changed road layouts. Two views of the bottom of Prince of Wales Road looking north. 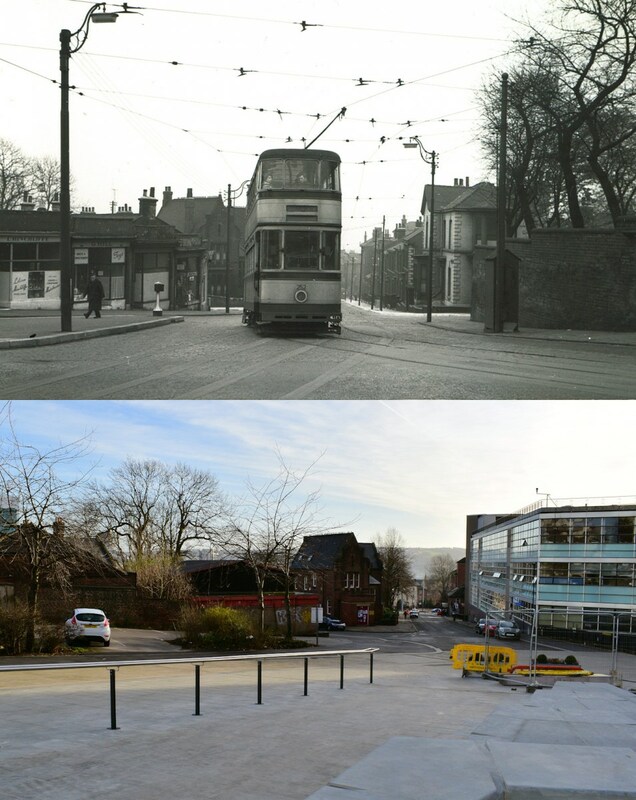 First up is a view of the 1950s road layout at the junction of Prince of Wales Road, Main Road and Greenland Road and a modern approximation of the same view. Date of the then shot unknown, now was 27/12/16. A few days earlier I made it to Wadsley Bridge for a couple of shots. A closer view of the bridge from the other side of the road. Then shot date unknown, now 24th December 2016. 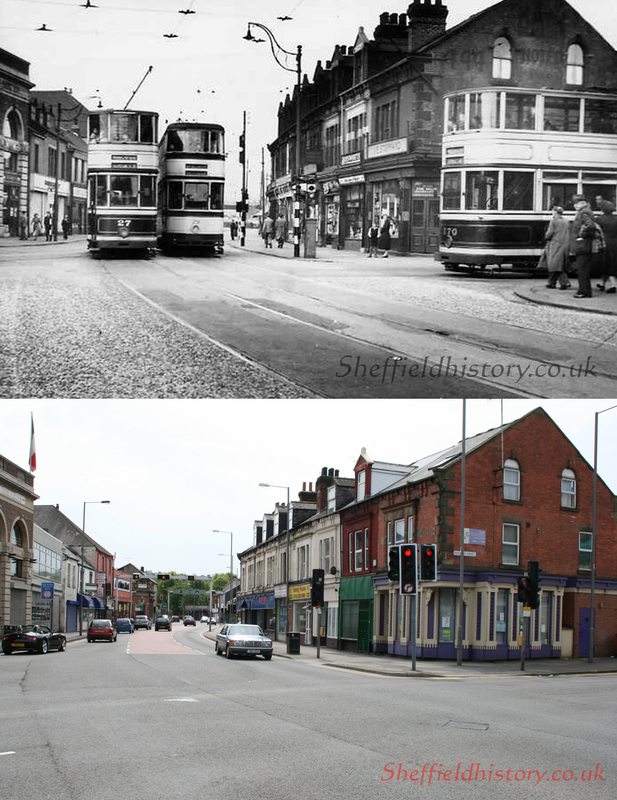 A bus journey through town took me to Abbeydale Road and an amble back into town for the next shots. 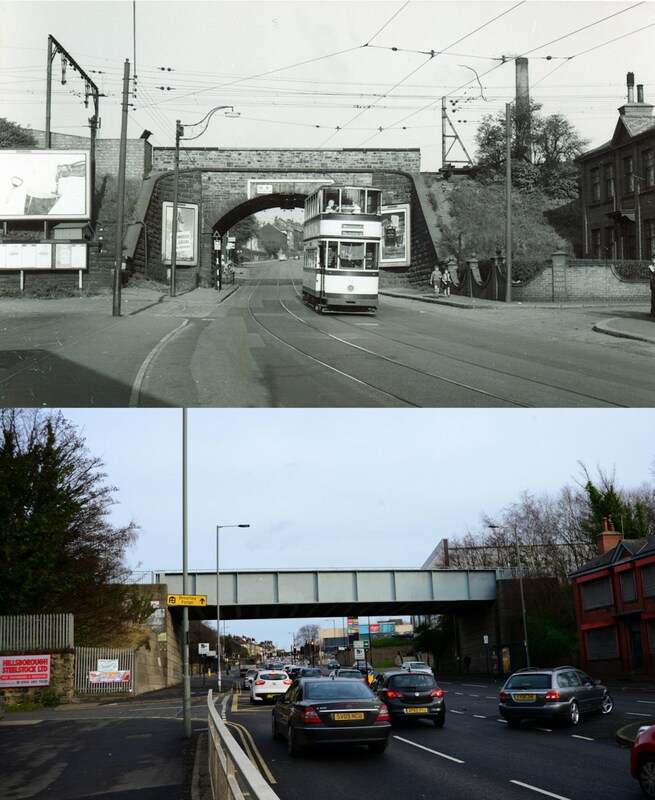 First up is a view of the railgrinder 330 crossing from Wolseley Road into Queens Road on 5th September 1959 with the now shot from 24th December 2016. The stonework on the old bank has been cleaned, not sure what was going on with the wall on the left and the houses in the background have all gone. And along Shoreham Street for two shots. Number 73 on a Woodseats service and number 1 coming off the Cherry Street spur on a special, probably an enthusiasts tour given the lack of crowds on 29th April 1956. My list of tours is not to hand at the moment, alas. Not a great deal of change along Shoreham Street, although I was amazed at the number of for sale and to let signs on the properties. And a bit further on, at the junction with Charlotte Road, car 6 with a makeshift front panel is working a special. This is probably a football special as there are quite a lot of people around and the shot dates from 7th April 1947. On that day United beat Bolton Wanderers 4-2, their third game in 4 days. The now shot is from 24th December 2016. After some meandering the next shot was the bottom of London Road. Thank goodness for solidly built banks, as the old Midland Bank between Cemetery Road and Ecclesall Road was the only point of reference here. 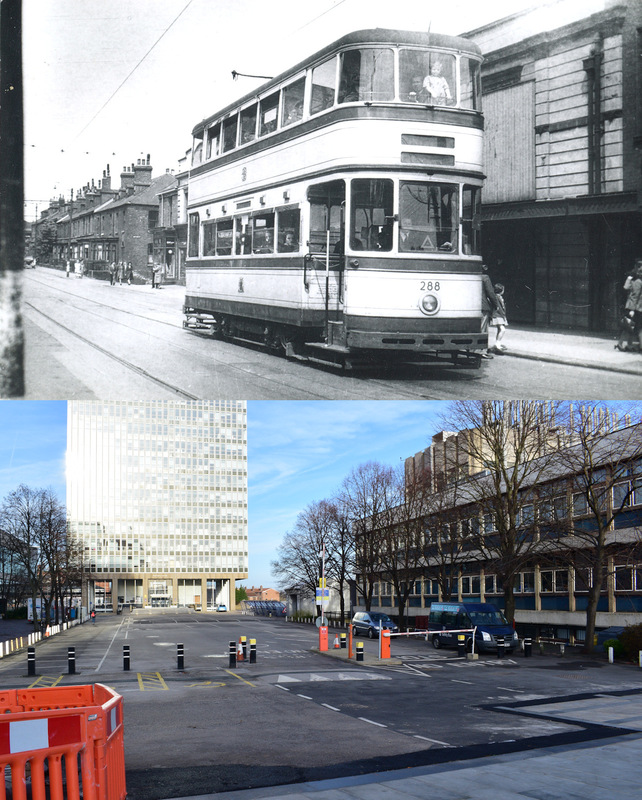 All else has gone, including the roundabout with tramlines through the middle. Then shot undated, now shot 24th December 2016. Another undated shot of a Roberts car. This time 511 is seen coming off the kerbside loading line on Pinstone Street on an unknown date. The now shot was 24th December 2016. I chose to not have a bus in the shot as it would have blocked out much of the changed background. Back to 27th December's perambulations for a few taken around the city centre. First up is another shot of Pinstone Street, this time at the Moorhead end. 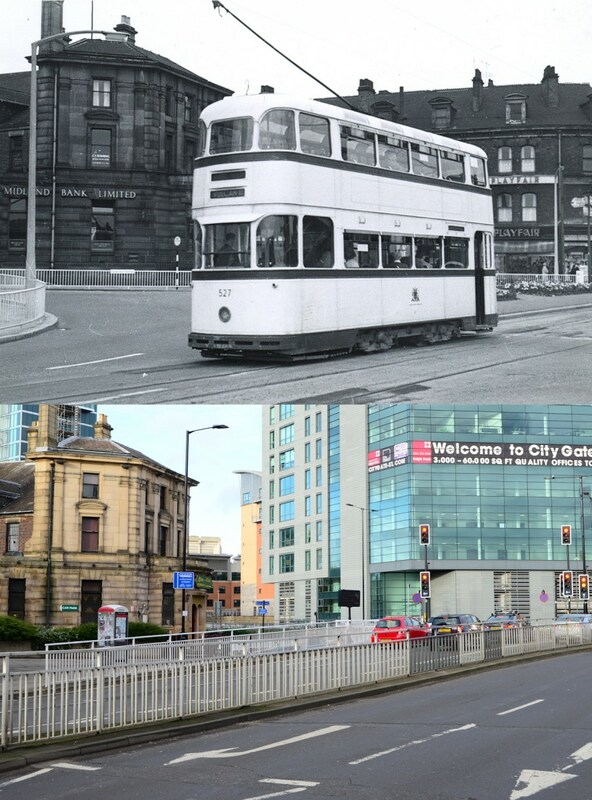 The buildings to the left of car 440 were replaced in the 1960s as part of the building of the Grosvenor Hotel. That replacement building was being demolished at the end of 2016, hence the sheeting and scaffolding. 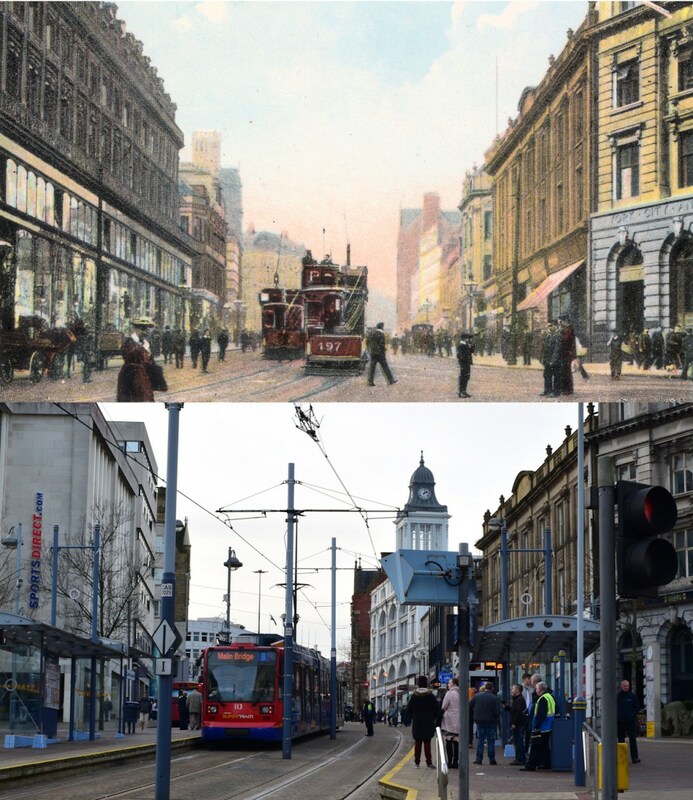 High Street: then is a postcard with a postmark of July 1908, although the picture probably dates from earlier as a route letter is in use and car 197 had a top cover fitted in 1908. The north side of High Street looks pretty much the same in December 2016 (excepting Kemsley House), but the south side has changed somewhat courtesy of Mr Hitler. 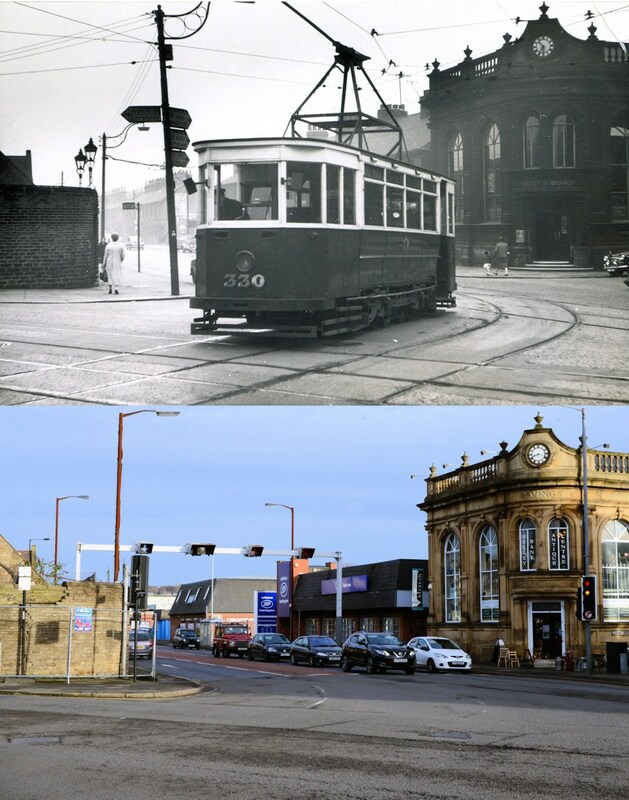 Exchange Street was the terminus of tram services to Rotherham and Lane Top via Attercliffe. These days it is a bleak partially pedestrianised road, looking even more forlorn since the demolition of the Castle Market. 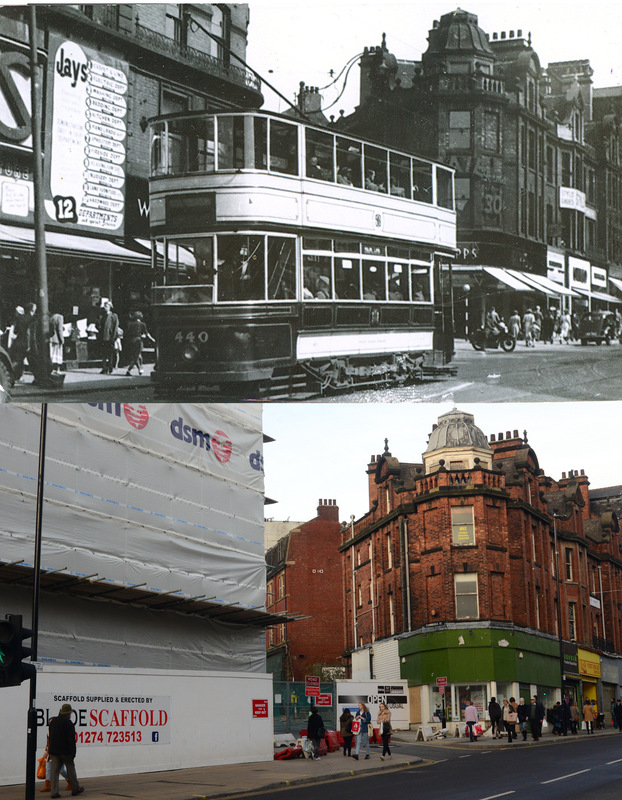 I wanted to take a "now" shot some time ago before the Castle Market came down but I never made it, so both the then and now shots show nothing adjoining the pub. 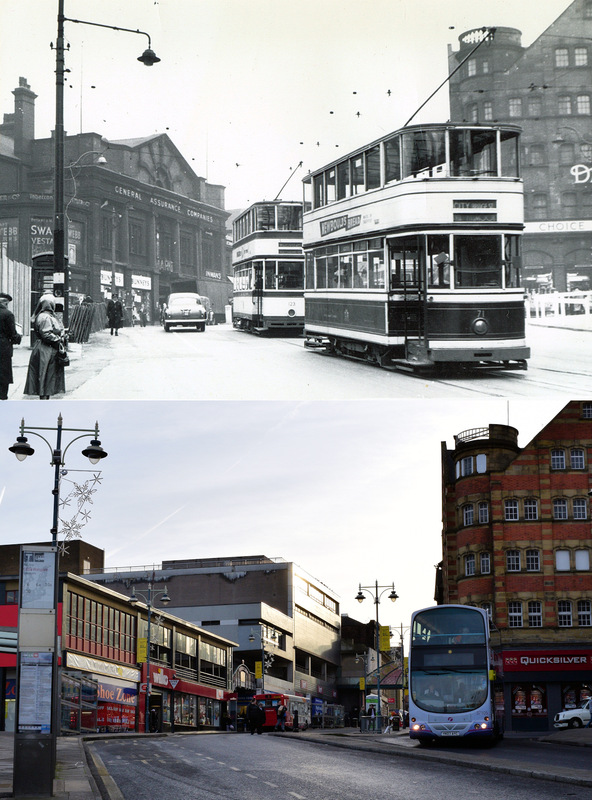 Back then (11th August 1953) car 177 was alongside the Rotherham House, now (27th December 2016) the Market Tavern stood boarded up with a hoarding around the site of the market..
And finally (for now), Waingate looking towards Haymarket. Cars 71 and 123 heading towards Haymarket with the Norfolk Market Hall prominent on 9th April 1958. The same view on 27th December 2016 with a bus on the right hand side so that the changes on Haymarket can be seen. 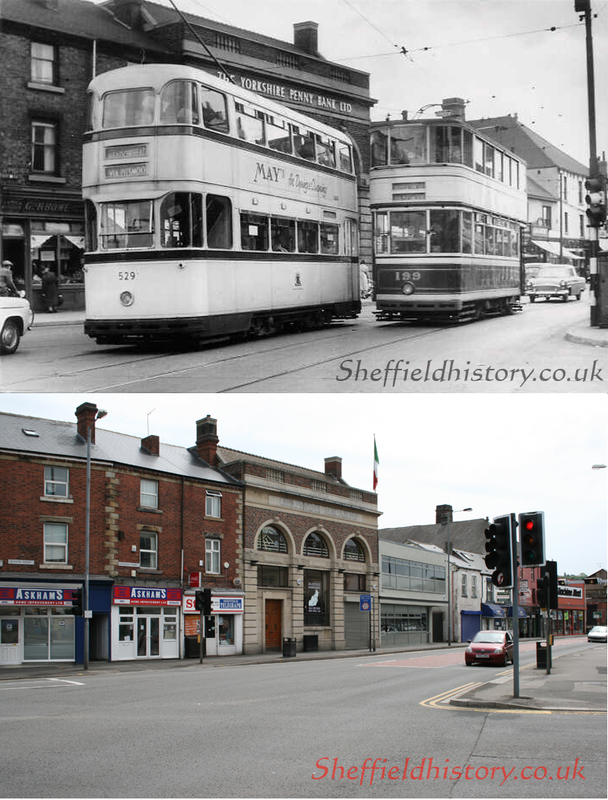 These B&W photos bring some memories back, the shop on the left of Tram 262 shows Hills Corn Stores, my sister Eileen and myself used to go to this shop to buy a stone of corn for my Dads hens, plus the Darnell Cinema in the background of Tram 273, I spent quite a bit of time there when I was under twelve . 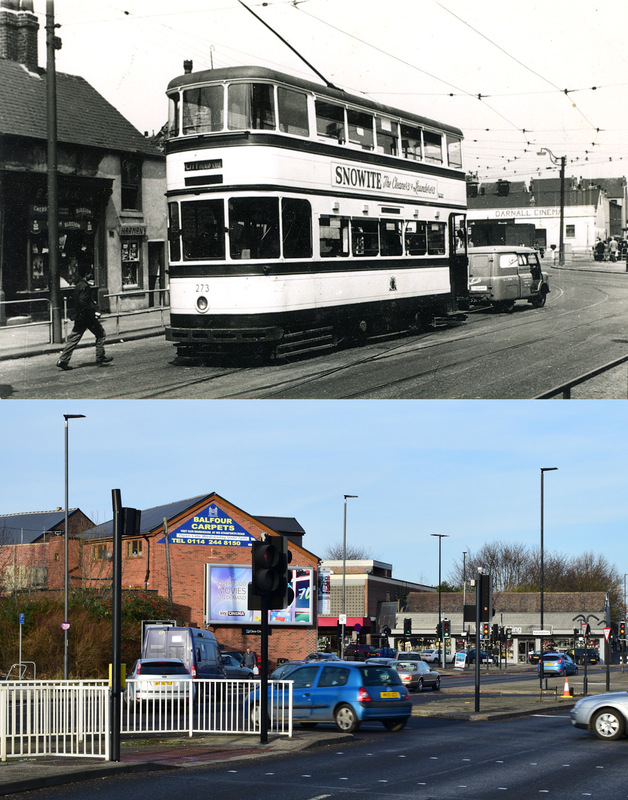 Rotherham bought 11 single ended trams in 1934/5 for use on the Sheffield service as both termini were loops. 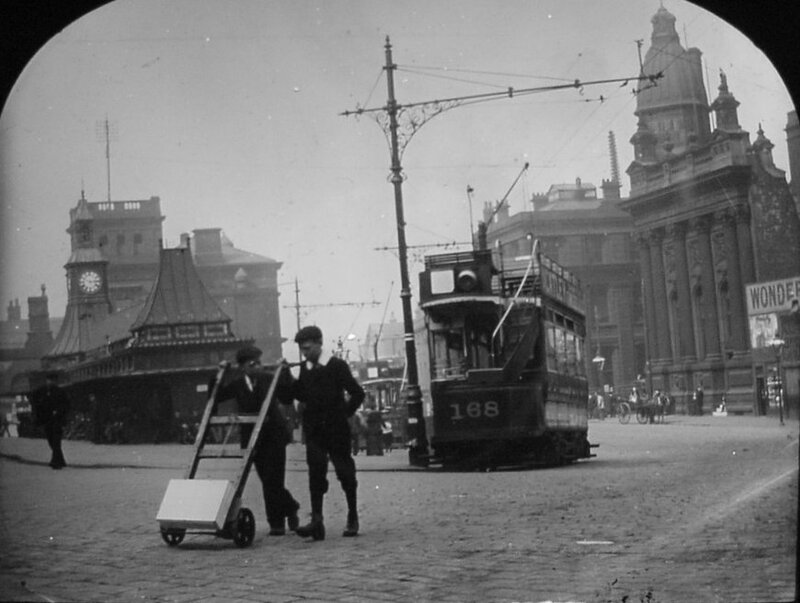 A reversing triangle (rather than a loop) was built on Temple Street in Templeborough to allow the single ended trams to reverse when operating short workings. 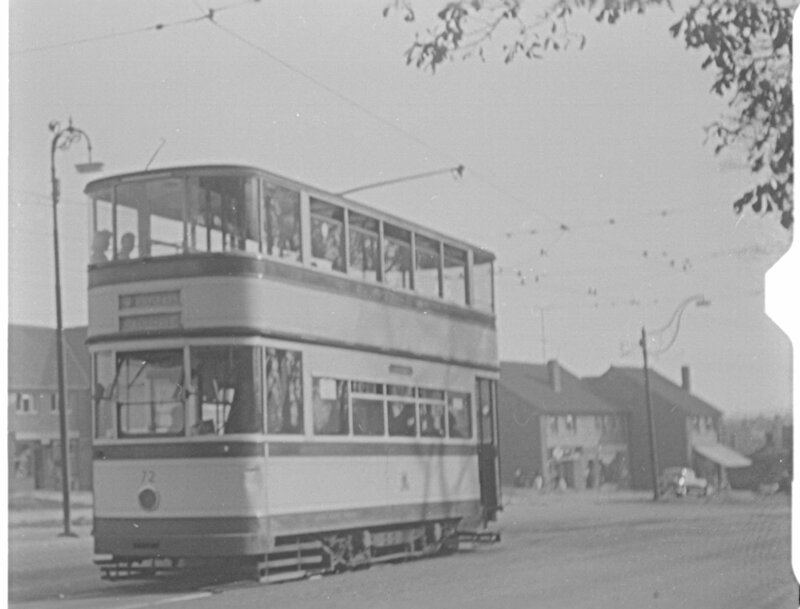 The triangle can be seen in this post along with one of the single ended cars behind Sheffield 501. Thanks madannie. 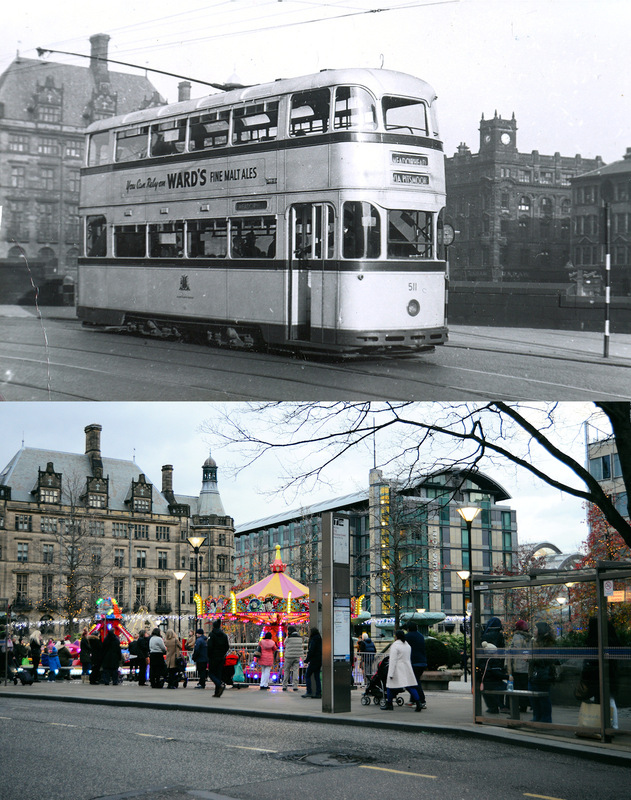 Rotherham went for trolley buses rather than trams, with 2 overhead wires trolley buses could not run into Sheffield . 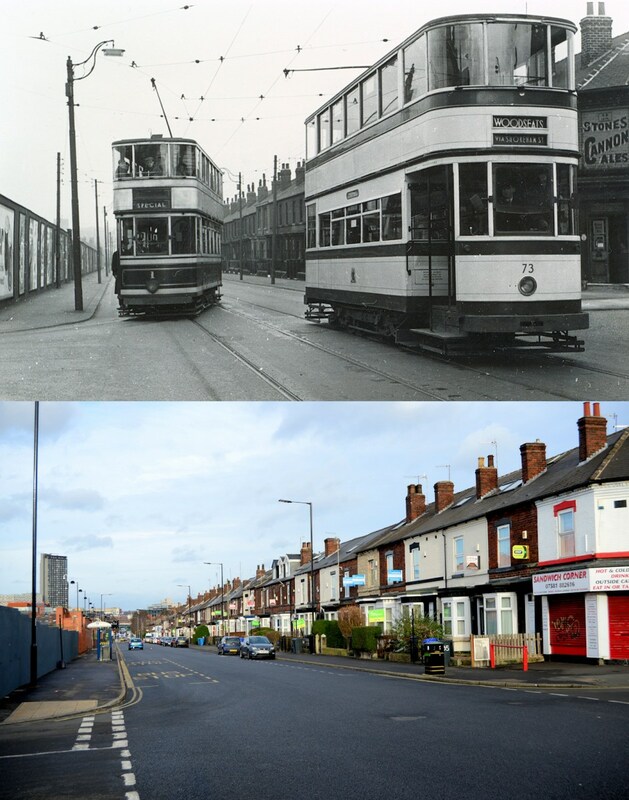 Rotherham had the longest trolley bus route in the country out through Wickersley to Maltby. 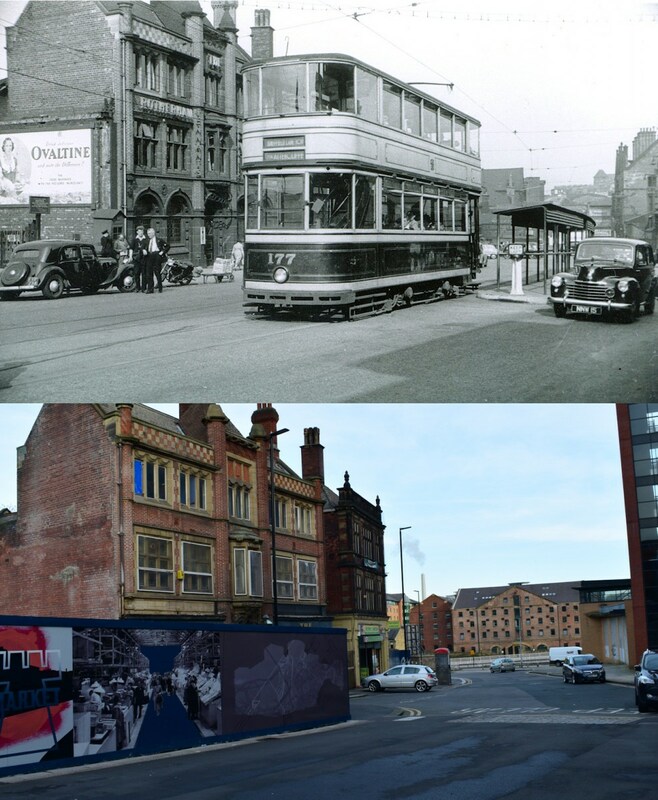 For your interest in trams here is a digitised glass slide picture taken by my Grandfather who was a keen amateur photographer, and one of series pictures of trams I that I took. 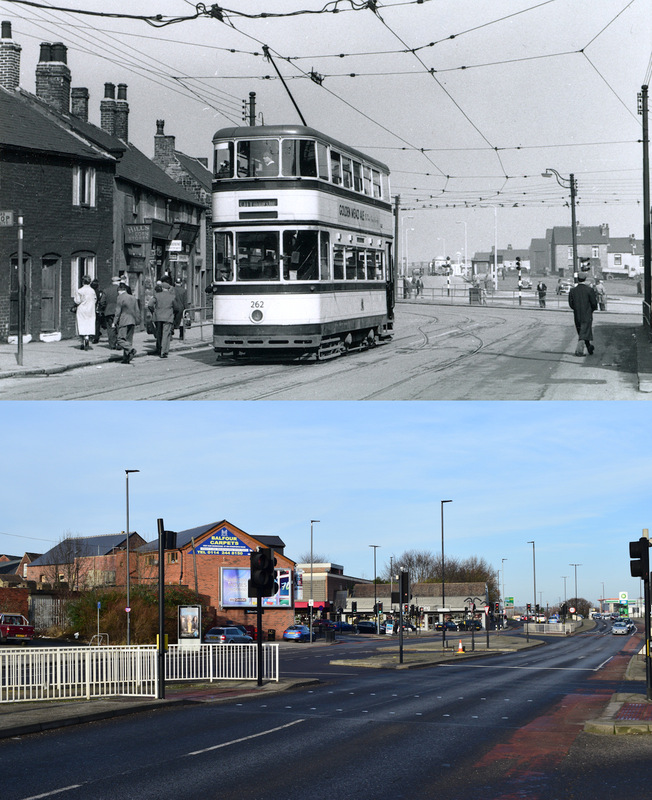 Both these are from similar locations looking up London Road from the junction with Queens Road nr Lowfields School. 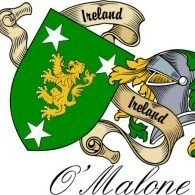 This is certainly the place where the . 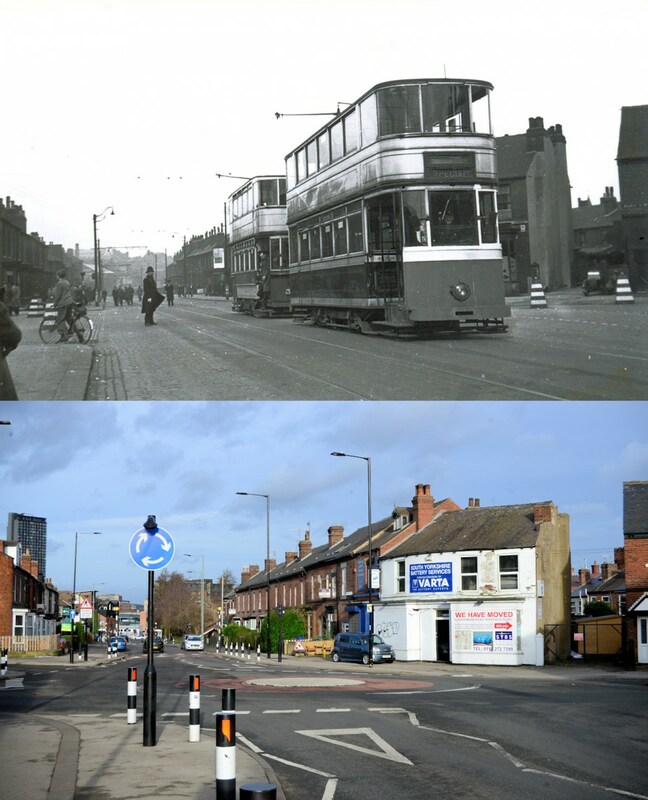 lines from Wolsley Road crossed the lines up to Highfields at right angles.The trams and most cars had no problems. If you were on two wheels it was a different matter as l found out the hard way. To get a smooth ride the Wolseley Road lines were raised up so the bottom of the groove was level with the top of the other rails so the tram got a smooth crossing The tarmac was level with them all over the crossing so the Highfield lines were down in a trough which was about motorcycle tyre width. Heading from Heeley to Queens Road meant crossing the deeper lines at a small angle, never a good idea particularly in the rain. Speeding happily long in the middle of the inbound line l was suddenly faced with the deep grooves in the road at the wrong speed. Panic is I think the right description followed by heavy braking and a quick swerve to get a safer line. I walked back to have a good look and sort out which were the problem routes from the safety of the pavement edge. Suffice to say that after that when motorcycling that whole area was treated with caution. Cars buses and lorries with wide tyres could ignore this odd unique crossing design. I often wondered how cyclists fared. I remember my uncle getting his bicycle wheels stuck in the tram tracks on Abbeydale Road, pedaling like hell with a tram behind him, then jumping off when the tram stopped and pulling the bike away. Looking at the photo's of Heeley Bottom I can only wonder what kind of thinking reduces such a great shopping area to what looks like deserted streets..
Short workings to Steel Peach and Tozer's works gate, destination "Templeborough", just inside the Rotherham boundary, required the tram to do a classic three-point turn by reversing back left on to a short siding in Temple Street, then out forward right back home That layout was laid down to suit the new style trams in 1934. The other necessary use would psumably be going part way round the Rotherham loop, then backing along Effingham Street to the depot. Obviously the usual method as every depot photo shows them pointing towards Rotherham town centre. However, nobody seems have managed to photograph one going in reverse. Pity they were all scrapped before preservation took off or we might have seen one running the length of Crich in reverse. If only! What a great thread! That's passed on a couple of hours, when I should be working! I found the thread from google images, as trying to see if I could find a shot on Paternoster Row to match the shot I took today. Just a thought. The earlier picture was taken on a Sunday. Might this have been a special taking Boy Scouts to the City Hall for the annual St George's day service?